On January 3rd, 2019, we embarked on our first Millennial Future Retreat. This retreat was a complete success and proved to be a catalyst that will carry us into the Future. We landed in San Jose, Costa Rica and linked up at a nearby hostel. Myself and guide Zach Wolfe had each extended invitations for the retreat to our friends and family. We found our first pair of explorers faster than we could have imagined! Julian (left) hails from Houston, Texas and Kara (center) from Baltimore, Maryland. After a brief night in the capital of Costa Rica, we hopped on a bus and headed for Panama. The boarder crossing involves disembarking the bus, getting passports signed, and a light bag search. Quite painless! We arrived in David, Panama in the mid afternoon and opted to stay the night since we have friends who work at a nearby hostel. A refreshing pool and tropical decor welcomed us as well as our first wildlife sighting. A friendly gato solo. The next morning around 10am we packed up and took the short ride to the nearby mountain town of Boquete. These public buses run every thirty minutes and cost just $1.75. In Boquete, a sharp climate contrast presents itself as cool, windy, and with light rain showers. Boquete was founded in 1910 and is a popular destination for tourist and Ex-Pats alike. English is present in most restaurants and there is even an American style micro-brewery. Plenty of great views as well. This is a great stop as a stepping stone into Panamanian culture as there is also a large population of the Ngabe Indians there. More to come on them! From Boquete, we chose to take a private shuttle northward over the mountains to a small port town on the Caribbean Sea called Chiriqui Grande. This town is the gateway to a large portion of the Ngabe Indian reservation.. better known as Comarcas in Panama. There is a fleet of water taxis that run daily to the villages all over the Comarca. Since there are no roads, the water taxis are the only access into the large swaths of undeveloped lands. The drivers run the boats every day and are skilled at knowing the sea and river conditions. The drivers are eager to have us on their boat and jokingly compete among each other over who should take us. They load our gear while we set off to do some shopping in the humble town. The boat leaves the port town, Chiriqui Grande, around 3pm into the Comarca and doesn’t come back out until 7am the following day. We plan to spend the next 4 days living in the Ngabe Indian community called Boca Guariviara. This small community is where guide Chandler spent two years living as a Peace Corps Volunteer! 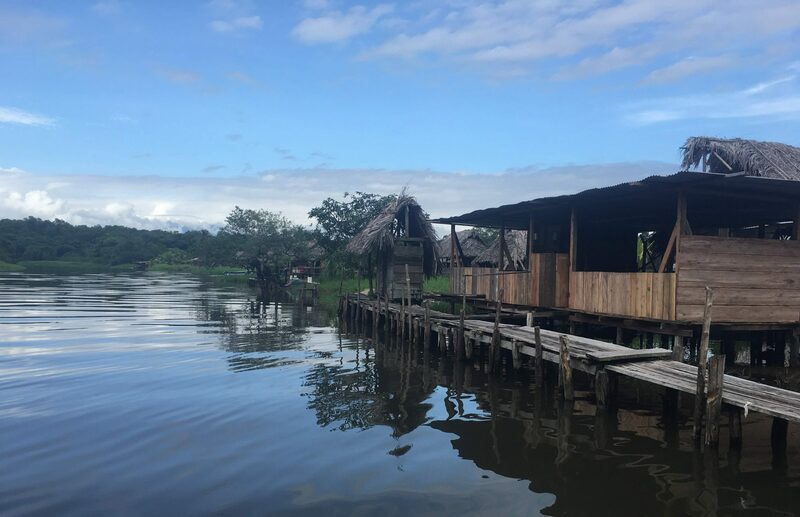 Boca Guariviara is the first community up the Mananti river and is comprised of 45 wooden houses built along the waters edge. Many houses have docks extending into the water that the taxis can tie up to. These houses function as rest stops for the water taxi travelers. Here the family who owns the house typically sell lunch by the plate, cold soda, candy, and gasoline. The boat riders who will continue traveling up the river are welcome to eat, use the restroom, and converse to spread the latest news from outside the reservation. But since this is our stop, we unload our gear into the house and sit down to have our first plate of authentic Ngabe cooking. Rice, beans, and chicken are on the menu and we gladly order a plate. Afterwards we walk over to the home of Johnny and Maria Bonilla. They are two seniors in their 70’s who helped to found Boca Guarivara over 40 years ago! They are welcoming and honest people. Having the opportunity to stay in their home during the retreat is one of the most rewards aspects. Like all Millennial Future retreaters, Kara and Julian both receive their own secure room with beds and bug nets to sleep in. We spend the next few hours talking and getting to know the community members. Julian and Kara are each given names in the Indian language Ngabere to use during their time in the Comarca. Kara is Malu (Ma-lou), and Julian is Joregochi (ho-re-go-chi). Pictured above from right to left are Nacho, Juli, and Cobra (all nicknames). Ngabes are required to have a formal name for identification purposes, but they prefer household names in their natural language. Pictured above is Senor Olmedo Santos and his wife Elsa Bonilla (with permission given to show). Before long we are invited to play soccer! We pile into the handmade wooden canoes, grab a ball and head down the river to a large tidal sand beach. The boys run circles around us extranjeros (foreigners). Its dark by the time we get back to the house. After showering in the Bonilla’s private washroom, we eat and promptly head to bed. Our second day starts slowly with some coffee, conversation, and a light morning rain shower. We have a plan to boat out to the beach and spend part of the day helping a community member work on his property. Wooden boats like these cost around $700! A small fortune in these parts. When we got out to the property, Julian didn’t hesitate for a second to jump into action. He swung the machete like a natural and did his best to learn from the locals. Afterwards, a lunch intermission and rest period followed. We then loaded back into the boat and set off for another location with a special goal. Armed with a powerful green LED light, we knew we had a chance to see nighttime wildlife in all its glory. So with our community guides leading the way, we crept up a small creek as the sun slowly set..
Before nightfall we had already spotted wild turkey, sloths, and parrots. Armadillos, Cayman crocs, and iguanas soon make their moves as we watched silently from the boat. We didn’t hunt the animals, just enjoyed observing them in their natural habitats. Our third day we took an invitation from our host, Johnny Bonilla. We joined him in a trip to his farm where he and his family grow their food. This was a very special opportunity as a quality farm is known as a sign of wealth and Johnny was eager to show us his. The view from Johnny’s farm along the river. Johnny led us into his farm and showed us where he had worked hard to drain standing water and keep all his trees well kept. He has several different sections of the farm that each produce a food product. Banana, Plantain, coffee, coconut, limes, yucca, and several relatives of the potato all are grown on the farm. Johnny even has an older cacao farm (this is what chocolate comes from). The land produces so much edible food. Sometimes it even falls off the tree into your hands like this plum. Kara loved every minute of the farm visit and did her part to harvest some plantain. This haul represents several days of food for Johnny’s family. They will supplement with rice, beans, chicken and fish. All this work leaves you tired! Nap time from 3-5pm is highly encouraged and functions as a reflection period for the retreaters. A good time to relax and contemplate the difference in lifestyle you are experiencing. An evening card game of spoons keeps the tone playful and relaxed. All the folks pictured are related to the Bonilla Family! The next day we said our goodbyes and caught the water taxi on its way to the port town. It was time to wash some dirty laundry..
We head north from Chiriqui Grande and enter into Costa Rica the same day at the north frontier. Just on the other side is a beautiful beach town called Puerto Viejo. This is a good place to rest up and a time to absorb all that has happened during the trip. Sometimes returning to your life back home can seem daunting after such an impactfull experience. But remembering to reflect on the comforts and lifestyle we have in the United States will help you always remain grateful. What the Ngabe Indians will teach you is something you can take back to your life in the States. To find out more information on Millennial Future Retreats, please see our website and use the Contact Us us forum.